Have you had a chance yet to check out the new Workers’ Comp Hub website, launched recently by National COSH and the National Economic & Social Rights Initiative (NESRI)? If not, don’t worry. 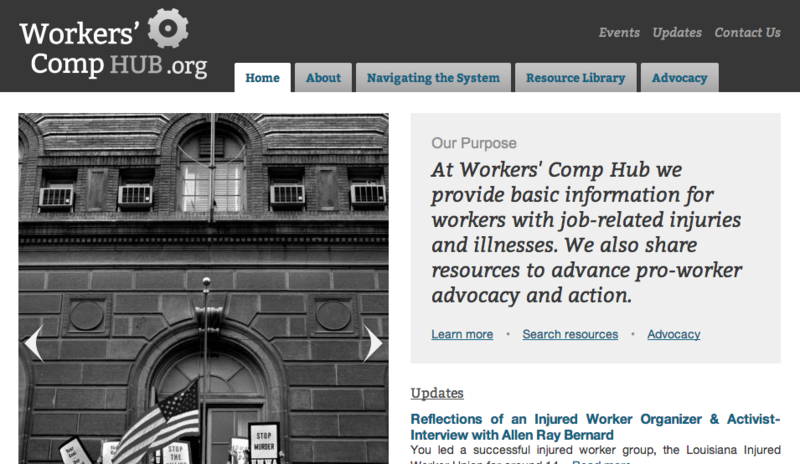 There’s still plenty of time to explore this great new resource for injured and ill workers. A platform for sharing human rights based strategies and solutions as well as promoting actions and events. Interested in being a guest blogger for Workers’ Comp Hub? Contact Dorry Samuels (dorry.samuels [at] gmail.com), National COSH’s Communications Manager, and she’d be happy to help. Our aim is to build a broad based network that connects policy efforts in workers’ compensation with advocacy and organizing on the ground. We invite you to share feedback, resources and tools as well as suggest events and actions for inclusion. Email us at info@workerscomphub.org.